Turpentine oil is obtained from the resin of coniferous trees. By using turpentine oil in raw materials, the final product has a pine smell, which has become a desirable feature in many cleaning products. Turpentine is commonly used as a solvent for resins, varnishes, and oil-based paints. In the pharmaceutical industry, turpentine oil is utilized as an ingredient in decongestive chest rubs. Turpentine oil can also be applied topically for treatment of cuts or for removal of lice. The fragrances in toiletries including soaps, toothpastes, and bath agents are often derived from essential oils such as turpentine. To collect resin for turpentine processing, pine trees are cut into V-shaped patterns. Resin is then released by the wounded trees to seal the openings and protect the tree from microbial infection. V-shaped cuts are favored to channel collection of the resin into containers. Once the resin is collected, it is processed into volatile components (turpentine) and solid components (rosin). A steam distillation is performed to separate the turpentine and water from the rosin. These liquid components are then transferred to a tank to be separated; the turpentine oil is lighter than water and therefore rises to the top. Turpentine and rosin can also be recovered as by-products from chemical pulping of pine trees for paper production. A fragrance producer contacted Hanna about measuring the refractive index of their turpentine oil. The customer was performing a variety of quality assurance tests on their turpentine oil, including refractive index, specific gravity, and gas chromatography, and was in need of a new instrument for determination of refractive index. 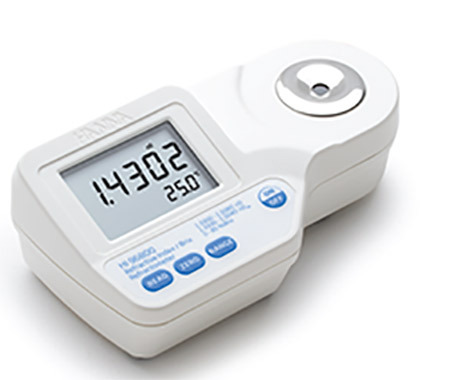 The Digital Refractometer for Refractive Index and Brix – HI96800 was recommended. Turpentine oil typically has a refractive index between 1.4600 and 1.4800, so the customer was pleased the HI96800 measured refractive index in the range of 1.3300 and 1.5080 with a high accuracy of ±0.0005. The customer appreciated that the HI96800 automatically corrects for temperature from 10 to 40°C, keeping it in compliance with ASTM D233 Standard Test Method for Sampling and Testing Turpentine. Being able to use a small sample volume was also beneficial for the customer as the refractometer only required 100 μL to perform a measurement. The HI96800 Digital Refractometer provided an affordable and easy to use solution to the fragrance producer’s refractive index measurement needs.